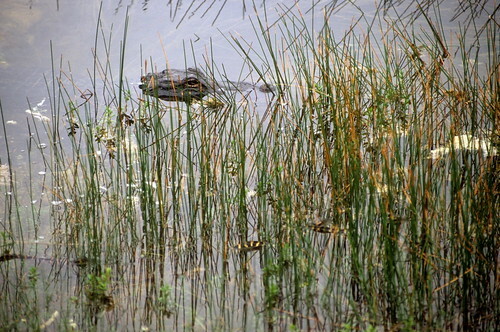 Summiting the Everglades, originally uploaded by The Bacher Family. Sometimes, what makes a great photo isn't so much great lighting or composition but great concept. (Of course, it's always best when you can manage both!) 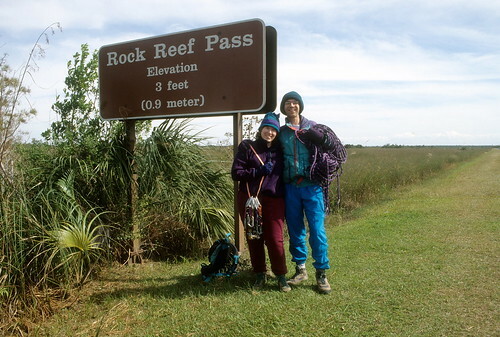 This picture's a good example of a great concept: the Everglades stretching out behind Kelli and me, our first winter in south Florida, having just moved there from mountainous Washington state... how could we resist photographic evidence of having reached the summit of this part of our new National Park? This was our Christmas photo for 1996! Jessica, originally uploaded by The Bacher Family. 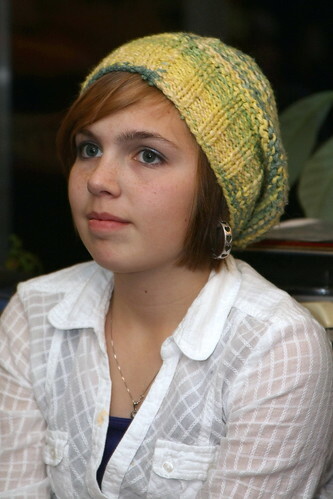 Not much to say about this photo, except that it's just a nice picture of my beautiful neice Jessica at Thanksgiving time. Happy birthday, Jessica! Laughing, originally uploaded by Jens T. (JT). Just goes to show, you can make great art anywhere. The description for this photo says "Hotel shooting. December 2009." I imagine the photographer and his model meeting at the hotel (or in a park), playing around with lighting and poses; there must be an assistant, managing the lights or reflectors I suppose, engaging the model in conversation, so that as she laughs, in a relaxed and unguarded moment,the photographer clicks the shutter, and captures a glimpse of a woman's soul. Vietnam Memorial Reflection, originally uploaded by The Bacher Family. 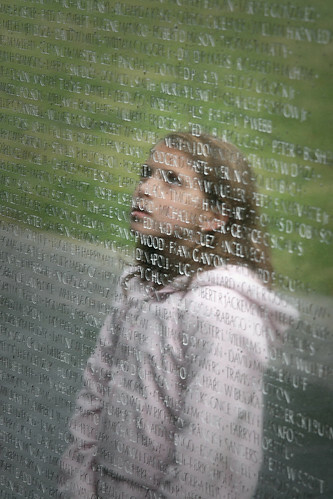 While visiting the Vietnam Memorial in Washington DC, I noticed this child reflected in the polished marble. The look on her face was so powerful, behind all those names. 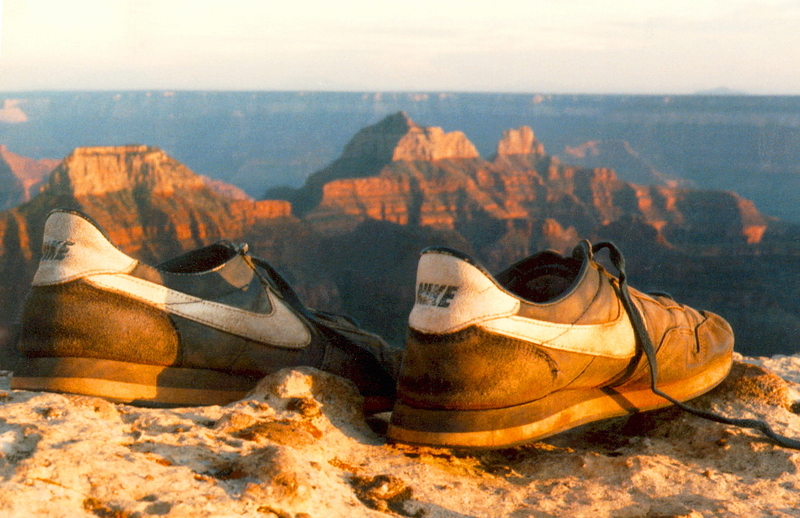 I wish the image were just a little sharper, but it's still one of my all-time favorite pictures. Elana, oiginally uploaded by Katie West! Some photographers stick to studio portraits of families dressed in suits and ties, smiling stiffly in front of a boring backdrop. Some mix it up a bit, but stay safely in the studio. Others, like Katie West, venture out into the real world, photographing real people who are about as far from the suits in the studio as you can get. Me, I find that a lot more interesting. This photo looks like Elana, the "model," just leaned down into the view of the camera and had her picture captured--no carefully symmetrical pose, but something infinitely more interesting. It's a way of seeing, and something I aspire to emulate. 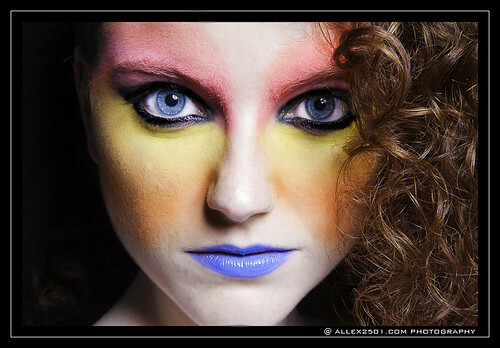 Speaking of unconventional, heres another one--a most bold and unusual self-portrait. The sensation of flying, originally uploaded by The Bacher Family. Here's another picture of my cute nephew, Matthew, and his mother Jennifer, at our home for Grandpa and Grandma Mettler's birthday party. I saw Jennifer playing with Matthew and fired off a set of shots, this one being my favorite; might have been even better if I had been a step or two further back, so the picture wasn't so tightly cropped, but at the same time I really like the close up look on the faces of mother and son. The lighting is interesting, too--I believe I bounced the flash off the ceiling, and you can see a bit of haloing on the top of Matthew's head, as well as glints of amber light on Jennifer's lips and teeth. The colors started out a bit flat, too, and I wonder if that's because of reflection off the red and tan walls in our living room. I was able to correct most of it, fortunately, by adjusting the color temperature and tint of the original raw image. Here's another photo from the same evening in the same setting, with the same color challenges. IMG_4603_1, originally uploaded by The Bacher Family. 116/365: Hoppipolla, originally uploaded by Grace Kathleen. Here's another photographer for whom the question of which image to feature is a difficult one. The fantastic portrait? The beautiful and technically perfect model, interpreting a scholar princess? I love both of those photos, but keep returning to this one, for its offbeat, lived-in look, with the expanse of glistening pavement, the bare feet, the posture appearing to be in mid-dance, and the awesome brooding clouds in the background. For sheer interestingness, it had to be this one. Columns, originally uploaded by The Bacher Family. 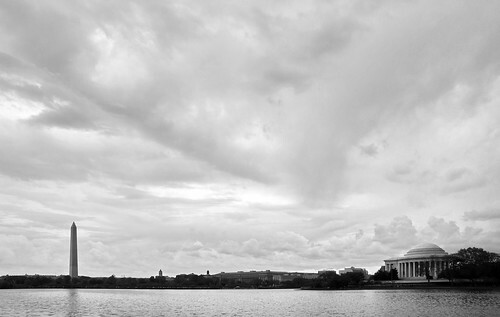 During a visit to Washington D.C. in April 2008, Kelli and I got caught in thunderstorm and took refuge in the Jefferson Memorial. I passed the time by taking pictures through the columns at the scenery beyond. 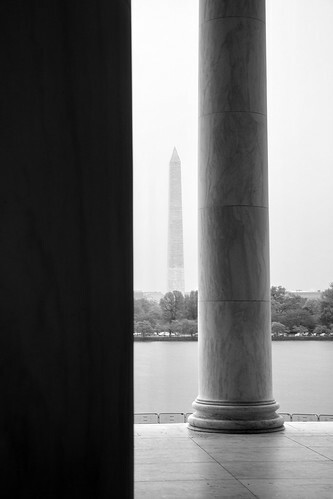 These were in color, of course, but so many of them look even better in black and white, with the strong lines of the columns and monuments and the texture of the marble. 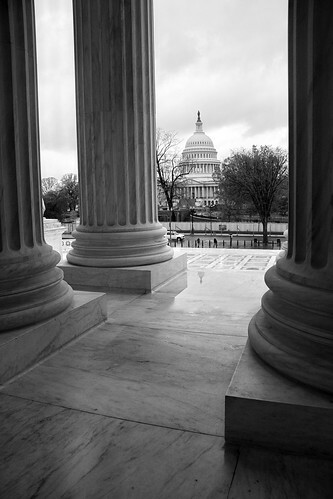 Here's another picture from the same set in a similar style, from the porch of the Supreme Court. supreme_court_view, originally uploaded by The Bacher Family. Waiting for birthday cake, originally uploaded by The Bacher Family. Have I said it before -- I have some of the cutest nephews around?! This is Thomas, patiently waiting for his Grandpa and Grandma Mettler to blow out the candles on their birthday cake (which you can barely see in the lower right corner). It's a flash bounce off the ceiling to give it nice even lighting, but it's the pose, with the hands under the chin, that really makes this a favorite photo of mine. Tomorrow's Thomas's own birthday, by the way, so Happy Birthday, Thomas! Images du Monde flottant, originally uploaded by ffrima. Sometimes, I react to a photo in interestingly conflicting ways. This photo, for example, by François Rimasson: for the most part, I love the picture. The model is beautiful, her pose classic, the draping perfectly framed to emphasize her flawless back while not quite dipping low enough to cross the line from classic to sensual. And yet: I don't think I like the cropping of the head. It helps to keep the focus on the back, I suppose, but for me, including the full profile would be less distracting. I also don't care for the loooong, curved eyelashes, which seem a bit affected to me. But these are details. 90% love it, 10% not so much. When I get a chance, I'll do my own version, the way I like it! First snow of the season, originally uploaded by The Bacher Family. 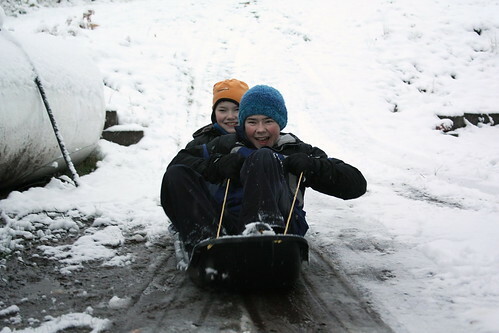 It's a time-honored tradition at our home: when the snow falls, the boys get out the sled and slide down the hill behind our house. We don't usually have a lot of snow, but once or twice a winter we get enough for a few good runs. We ended up with an unprecedented foot and a half this year, but this photo is from the first of the storm, when we still had just a slick few inches. I shot it in predictive focus mode, firing half a dozen shots at a time; this was the best of the bunch! 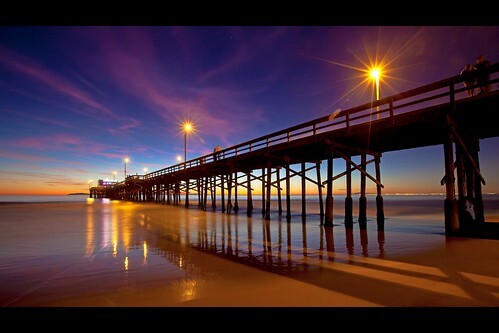 newport beach, originally uploaded by Eric 5D Mark II. It always impresses me when a photographer turns a mundane, everyday image--a pier stretching out into the bay, for example--into a breathtaking work of art. "Eric" (why do so many photographers refrain from revealing their full identity on Flickr?) manages this, near as I can tell, by using a great camera (the Canon 5D I've had my eye on, which takes great pictures in low light); careful composition; shooting at the right time of day, when the colors are richest; using a long exposure to smooth out the water and blur the people on the pier; and, I'm guessing, adding a touch of starburst in post-production, along with extra color saturation. Probably a Camera Raw image to begin with. It's fun to guess how such a nice picture was made, and even more fun to plan for my own version someday. Family Photo 2010, originally uploaded by The Bacher Family. 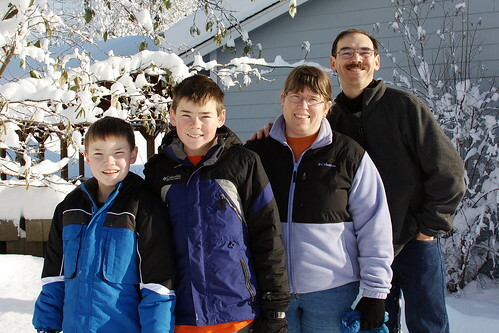 This is our 2010 Christmas photo, surrounded by the most snow we've ever seen in Eatonville--and before Thanksgiving! 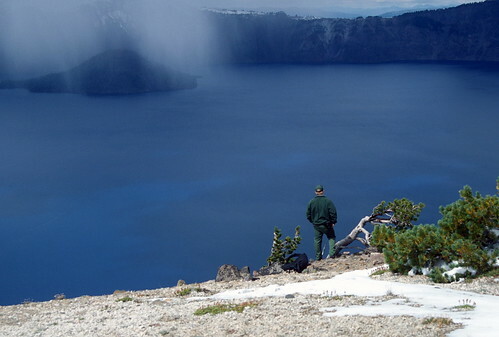 We weren't happy with our choices for Christmas card photo up to this point, so when this post-storm morning dawned bright and clear, looking so reminiscent of our days at Crater Lake, Kelli said "let's go outside and get a photo in the snow." It took us a while and some experimenting to find the right spot; the sun was low in the sky, so most places we were either squinting into the sun or too much in shadow. 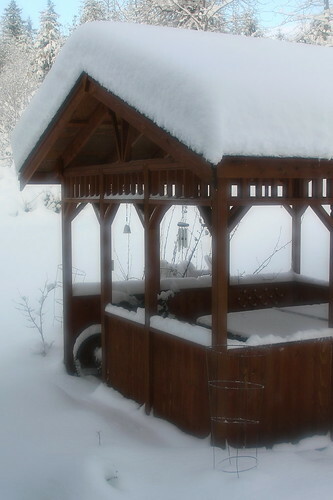 Finally I spotted the blackberry bushes along our side yard, covered in reflective snow, and said "aha, a fill light!" We're standing with the sun over our left shoulders but with the light reflected off the snowbank onto our faces. Presto! 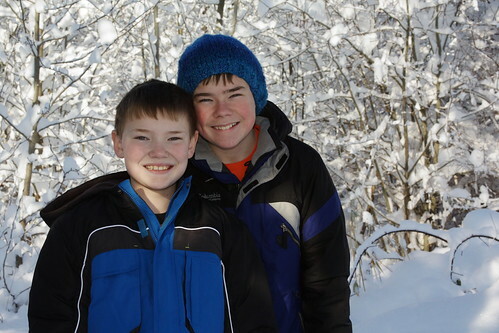 Here's one of my earlier experiments in the shadow of the alder trees along the edge of our property; it's not as great a photo, but it's a nice picture of David and Daniel. 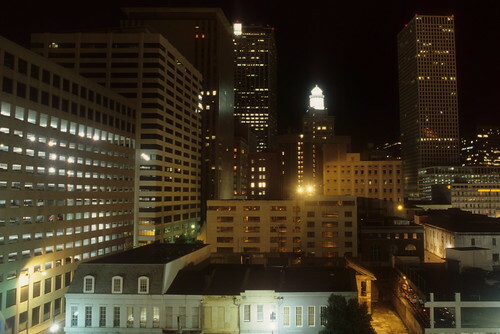 New Orleans by night, originally uploaded by The Bacher Family. In early December 1996, I attended some training in New Orleans. I shot this photo looking out my hotel window. To me, there's something beautiful about a city at night, with lights glowing everywhere among geographic shapes receeding into the distance. 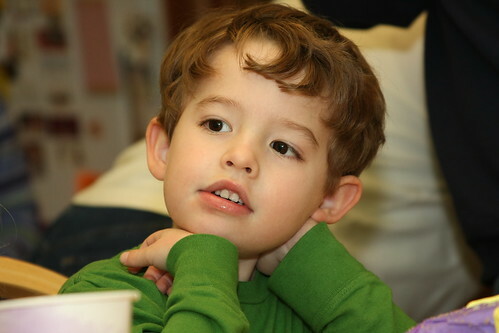 Matthew, originally uploaded by The Bacher Family. 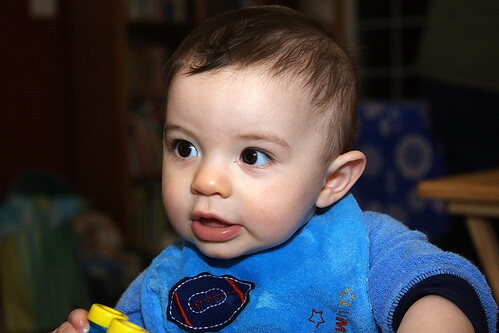 What is more cute than a baby, unless the baby is your nephew? Seriously, do I have the cutest nephews in the world, or what? Updated: Reposted when the original image was "not available." Why does Flickr sometimes change the file location of images? La Vie En Noire, originally uploaded by Broken Ghost Photography. Broken Ghost's photo set is a bit on the explicit side, so think twice about clicking through to his full set if you're turned off by such things, but the quality of his work is exceptional, and this photo in particular really made me stop and take a second look. It's daring in a completely different way--not because of what it reveals, but in what is subtly hidden in the shadows. Its a daring choice for the photographer to use a dark-skinned model, in silhouette, in a room that is dark to begin with--and yet, in this case, it works, and works fantastically. The subtle rim lighting, and the shadows converging toward their source, and the provocative pose, with the eyes hidden in the darkness of the model's face--it's brilliant. Update: This photographer is no longer online. Mary Mother of Light, originally uploaded by The Bacher Family. 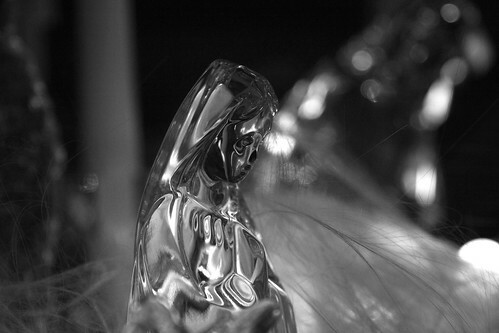 Our friend Diane's mother collects Christmas creches, so when we visited her house for a Christmas party, I couldn't resist snapping a few photos of this beautiful crystal version. I took the photos in color, of course, but in the amber light of the room, the glass just appears muddy in that version. I like it much better in black and white, which emphasizes the patterns of light both within the glass and in the room around it. I also like the way the narrow depth of field emphasizes Mary while diffracting the background into abstraction. Tristen, originally uploaded by the light is all. A few weeks ago, I featured two of my photos from my first-ever session at a real studio, Iris Photography in Seattle, in early October. I have so many great shots from that session that it's worth reprising the theme and sharing with you a few more images. This is one of my favorites simply because Tristen is clearly so comfortable in her skin; there's an ease and naturalness about her that is, in my opinion, very beautiful. We'd already taken a round of photos without props, and the photographer before me gave her this gold veil for some extra business to work with; it led to so great poses. Another one is below, which I love because of the prominent tattoo, which, for me, significantly adds to the character of the portrait, and reveals some of Tristen's personality, even without her face being visible. Both of these photos are also available in color: the one above here, the one below here. I prefer the black and white versions, but only barely, and reserve my right to change my mind. Which do you like better? Lora And Orange, originally uploaded by Barabaka. It always makes me happy when I have a hard time choosing the best photo to use to represent the work of an excellent photographer. Barabaka, from Kiev, is such a photographer: his work is consistently of great quality, and also wonderfully diverse. 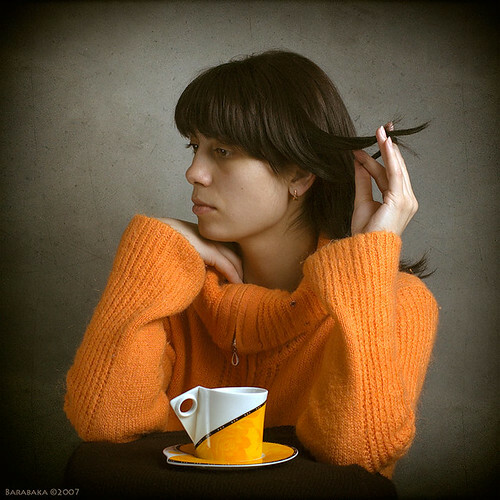 He produces beautiful portraits, like this one, which I love for its non-posed look, with the model ignoring the camera, fiddling with her hair, but perfectly framed, vignetted, and color-coordinated. He also takes great pictures of kids, fine art nudes (see below), even flowers, and just to prove he's an all-around fine artist, he also does great drawings. ***, originally uploaded by Barabaka. Kelli on Rune Hill, originally uploaded by The Bacher Family. I shot this photo of Kelli at the Rune Hill Retreat Center in New York, which had been such a place of refuge for me during graduate school. 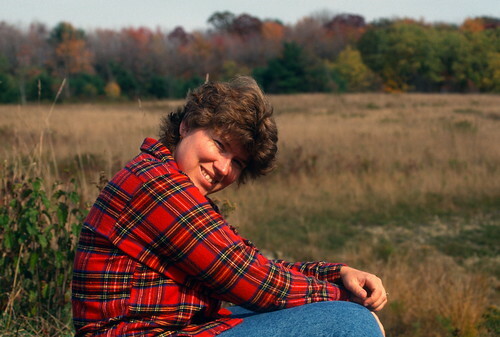 This was a photographic slide, and I'm very pleased that the scan of it has captured the rich autumnal colors of the original, with the afternoon light, red plaid shirt, highlights in the hair, and the beautiful October leaves in the background. This picture brings back good memories. Stephanie in the morning light, originally uploaded by The Bacher Family. On Thanksgiving Day, we joined our extended family and walked in a fundraiser for Habitat for Humanity. 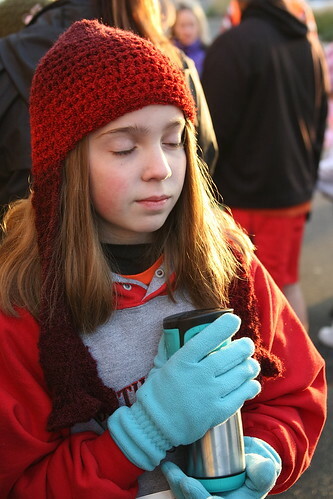 This is my neice Stephanie, bundled against the cold and enjoying the morning light and a warm cup of cocoa. Most of the time I'll glance at a picture like this and relegate it to the recycle bin because of the closed eyes, but on a second look, I really like it--the closed eyes give it a dreamy, contemplative look, and a lot more personality than a more traditional smile. I love the beautiful amber morning light, too, and the color saturation with all the red in the jacket and cap. Samanta Bernardes, originally uploaded by Allex 2501 Photography. 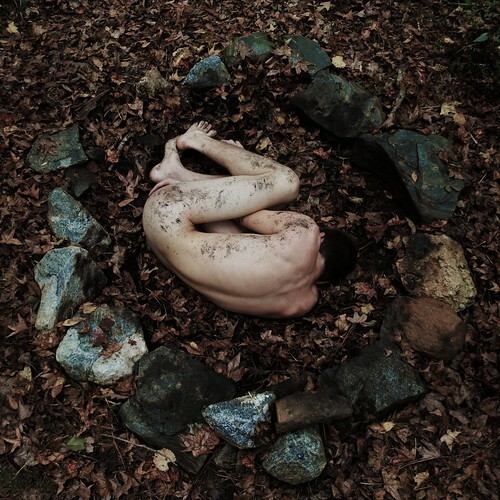 Yes, Allex Ferreira takes traditional portraits, too, and very good ones, as well as some creative fine art nudes. But this series is what really caught my attention and my imagination as I looked through his photostream. The use of color on this model's face makes for a very beautiful and intriguing image, and the palette he has chosen is inspired, with the brighter colors emphasizing highlights and the darker colors creating artificial shadows. The blue of the lips perfectly matches the eyes, the hair cascading down the side frames the picture perfectly (but, being on only one side, looks better than if it were on both sides of the image), and the tight crop draws attention to those gorgeous eyes. All around a great shot. Allan Dreyer, Artist, originally uploaded by The Bacher Family. 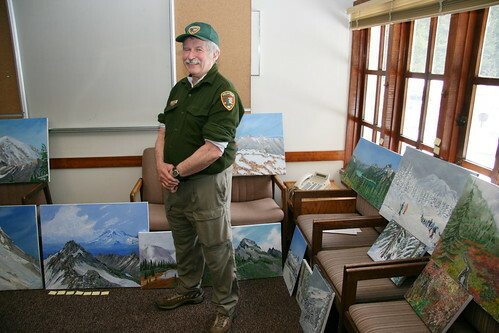 Allan Dreyer is a long-time volunteer at Mount Rainier, one of our most dedicated, who has helped the park in SO many capacities over the year: trail patrol, snowshoe walks, interpretive presentations, and most recently, painting. As you can see, Allan is a highly accomplished artist whose paintings of the park are gorgeous. I have three in my own home that I've purchased from him over the years. In 2008 he donated a large part of his collection for display in our offices, an act of incredible generosity. I took this portrait of him surrounded by his pictures on a snowy spring day; the light reflecting off the snow and in through the window made a nice softbox for the picture. Autumn leaf, originally uploaded by The Bacher Family. What's more beautiful than the leaves in autumn? I love this time of year, when the resplendent colors hidden in the foliage are unmasked. 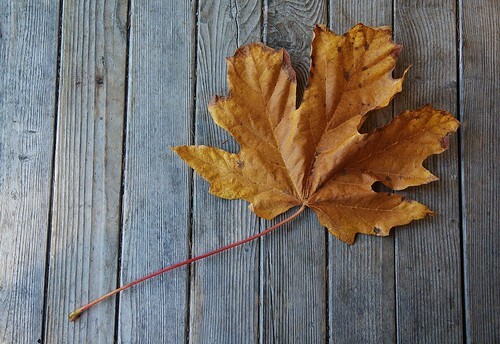 This bigleaf maple leaf laying on the wooden porch where we were having our staff retreat was just too beautiful to pass up getting a photo of. In Memory, originally uploaded by The Bacher Family. The winter of 1989-90, I worked as a seasonal park ranger at Great Basin National Park in eastern Nevada. My project for the winter was a fascinating one: to research and produce wayside exhibits on the "Osceola Ditch," a long canal designed to carry water to the dry east side of a moutain range from a spring on the west side, for the purpose of sluice mining. It was an audacious plan in the desert, and ultimately failed because the miners couldn't keep enough water flowing through the leaky channel, but not before the boom town of Osceola sprung up, burned brightly, and then flamed out. 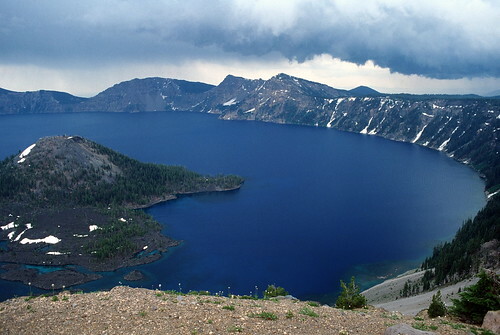 One winter day I drove over to Osceola to see the place for myself, negotiating unplowed 4WD roads. 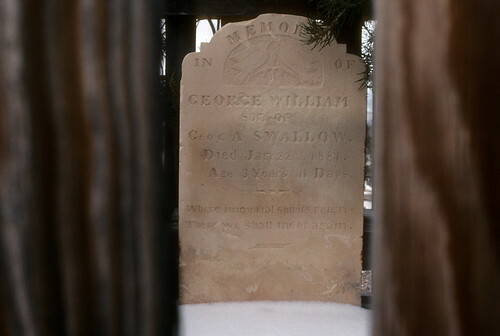 There wasn't much left, except an old cemetery, including this memorial to a child whose life was even more brief than that of the town where he was born.